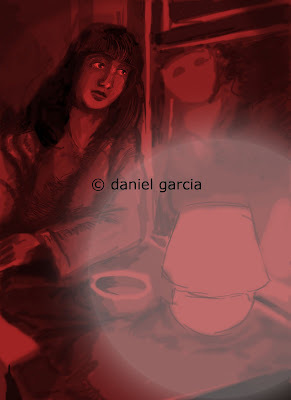 A sketch based on the book of the same name by José Saramago. 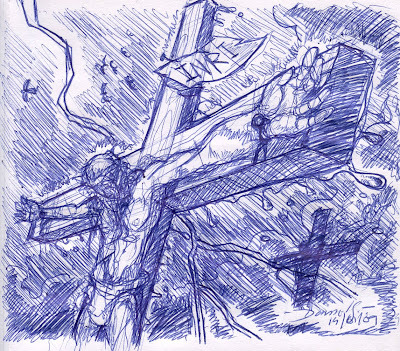 The story tells a worldly vision of the events associated with the Nazaren: the circumstances of his birth, the first questions asked at his mother, the encounters with angels and demons, the finding of love with Mary Magdalen, the existencial dialogues and the eagerness to know what is the true purpouse of his existence in the eyes of God. 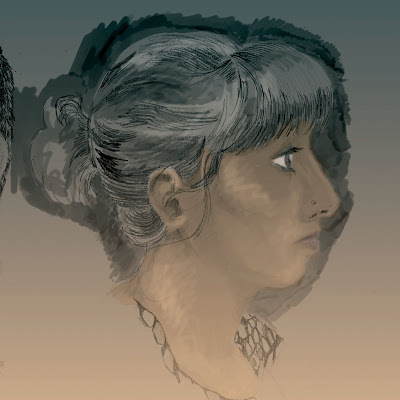 Intentando estar actualizado en este mundo sempre cambiante de la arte digital, he comprado una tabla - esta es mi primera experiencia (no muy buena:P) de coloracion por boli digital, baseado en una foto de una amiga. 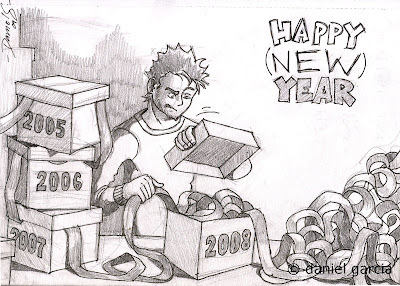 Celebrating an artificial break in time continuity. Call center seems to be pretty much the destiny of every single medium classed, 20-35 aged, european person in Barcelona. Crisis! Crisis! Working environement woo hoo, Picasso style (whose first artist steps were right here in BCN, at the age 13!). 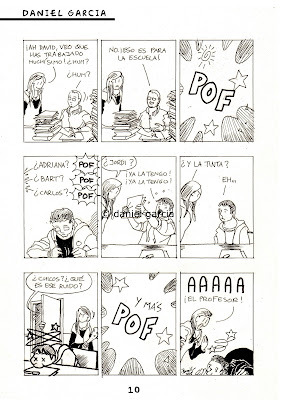 A funny short story about my class in JOSO (Escola de Comic i Arts Visuals) that made into the FANZINE we sold at the Saló del Cómic de Barcelona (March 2008). Infoespai is a center for social transformation located in Gracia, Barcelona. Among many things, it's a gathering place for cooperatives that explore many social issues (anti-trangenic food, alternative tv emissions and means of information, free intranet, etc), an alternative library, a space for debate, etc. 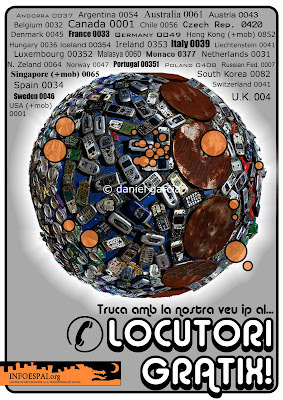 This is a poster was done to promote the free locutory that you can find there. 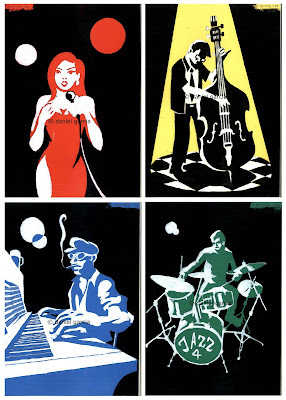 A group of four A4 illustrations in acrylic over coloured cradboard, for Illustration Class in Joso (Escola de Comic i Arts Visuals) - November 2008. I really enjoyed this one, the traget was to create a plain black+white+colour illusutration using a common motif and colour psychology. 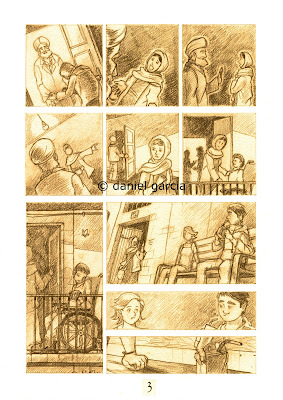 This work, in co-authorship with Catarina Alves, has been granted the 3RD PRIZE in the subject of Solidarity in the Comic Creators competition, organized by Caixa Mediterráneo, in order to promote its social efforts in the area of immigration. 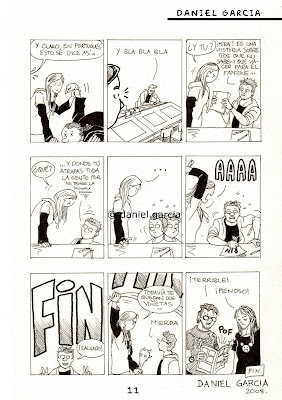 Its public presentation has been made in the 26th edition of the Intrenational Comic Convention of Barcelona (2008). 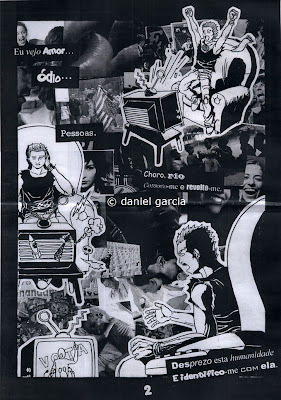 O Festival Internacional de Banda Desenhada da Amadora realiza-se anualmente, desde 1990, na cidade da Amadora, Portugal, com o intuito de promover a 9ª Arte junto do público através da participação de autores consagrados e autores amadores. Estes trabalhos participaram no concurso de autores e foram expostos no evento. The International Comic Festival of Amadora takes part every year, since 1990, in the city of Amadora, Portugal, with the purpouse of promoting the 9th Art to the genral public. It counts with the participation of renown authors as well as amateurs. These works were part of the competition and were exibited in the event. El Festival Internacional de Comic de Amadora se realiza anualmente, desde 1990, en la ciudad de Amadora, Portugal, com el objectivo de promover la 9ª Arte junto al publico. Conta com la prticipatión de autores conceituados y de autores amadores. Estes trabajos fueran parte del concurso y fueran expuestos en el evento. 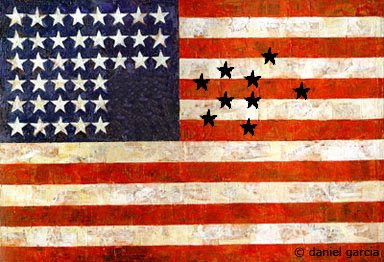 Daniel Garcia was born in Lisbon, Portugal in 1984. 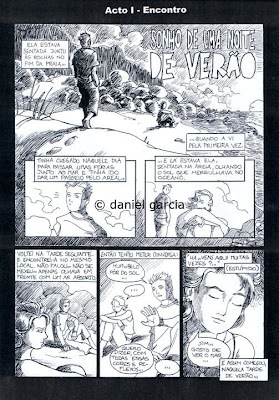 During the academic years he participated in three editions of the comic competition of the International Comic Festival of Amadora. 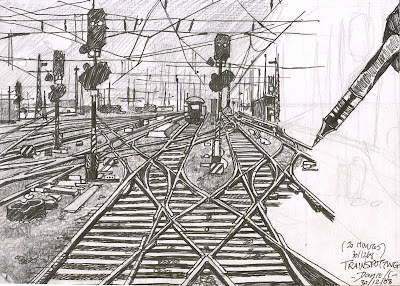 In 2007 he graduated in architecture in Faculdade de Arquitectura – UTL, after what he moved to Barcelona, Spain, and started studying at Escola JOSO Centre de Cómic i Arts Visuals. From that time until now he has participated in various comic/illustration competitions getting the 2nd and 3rd place in two of them. At the same time he has been collaborating with Infoespai social center as a graphic designer and activist. 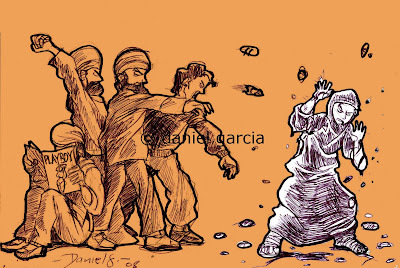 2009 _ 2ND NATIONAL PRIZE in the Comic Competition "European Union and Citizenship" promoted by the European Commission’s Directorate-General for Justice, Freedom and Security, and coordinated by Oikos. 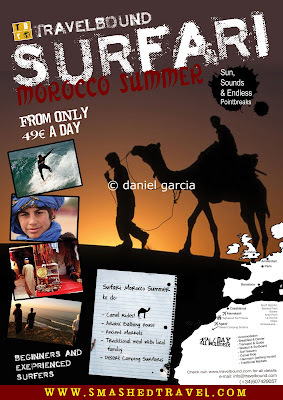 2009 _ Participated in the X. Poster Competition – Semninario Internacional de Zarautz, Zarautz, Spain. 2008/09 _ Designed various posters and flyers for the civic center “Infoespai”, Barcelona, Spain, alongside with other actions of social work/awareness. 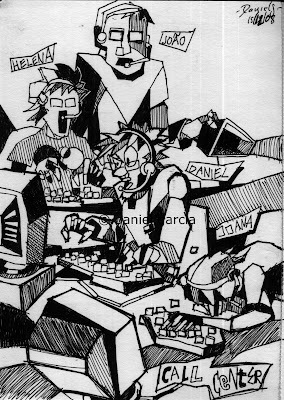 2008/09 _ Attended 3rd year Comic Course and 2nd year Illustration Course at Escola JOSO Centre de Cómic i Arts Visuals, Barcelona, Spain. 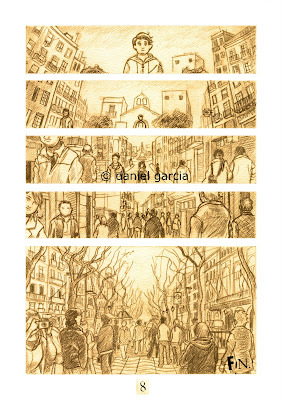 2008 _ 3RD PRIZE in the CAM “CREACOMIC” competition with the work PERIFERIAS. Competition organized by Caixa Mediterráneo. 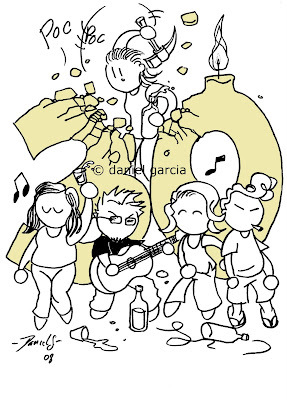 Public Presentation in the 26th International Comic Convention of Barcelona. 2007 _ Graduated in Architecture in Faculdade de Arquitectura – Universidade Técnica de Lisboa, Lisbon, Portugal. 2006 _ Participation in the Intensive Drawing Course AR.CO Arts and Visual Communication Centre, Lisbon, Portugal. 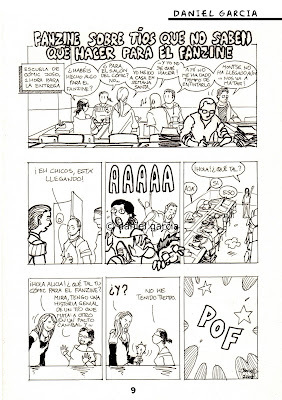 2004/06 _ Participation in the Comic competition within the 15th, 16th and 17th International Comic Festival of Amadora, Portugal .